Farhana posted this photo a few days later! 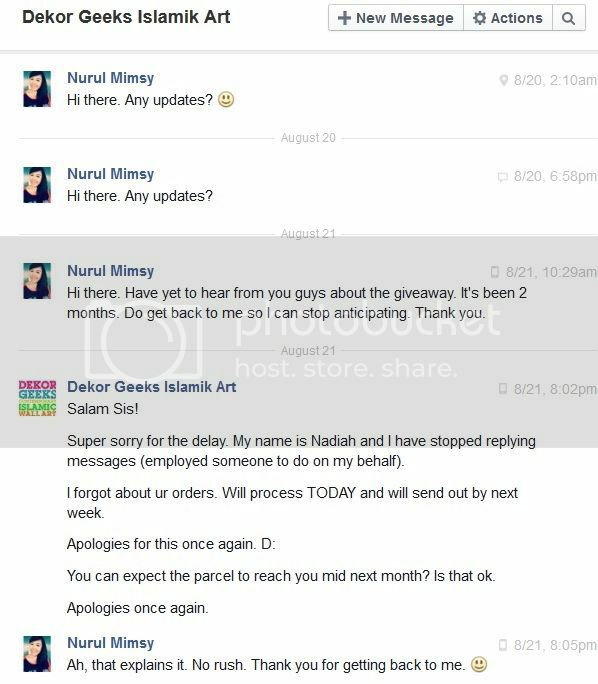 I emailed Farhana who hosted the giveaway, who then got Nadiah from Dekor Geeks to contact me via Facebook. I was given the choice to either browse through their Facebook albums for similar items or come up with something myself. I decided to give them specific instructions and requested to have different designs and different words to be printed on the different products. There was a problem with regards to some copyright issues (because the bimbo in me googled for pretty wallpapers) and I felt guilty giving so many specific instructions when I didn't even spend a cent but to my surprise, they handled everything very well! I did not pay a single cent (as it was a giveaway) and yet, they did everything they could to satisfy a free loading customer. I like people who give me alternatives. However, there was a tiny setback. I was waiting to get a confirmation on the package for quite awhile and did not hear from them for almost two months. I was getting pretty annoyed and wondering if they were gonna disappear because at around the same time this happened - but thankfully they owned up to their mistake and was honest about forgetting to send out my order. I understood that miscommunications happen especially in business and people forget things, plus I wasn't in a rush to get the stuff anyway. I was happy that at the very least, they acknowledged my concern and not just stay ignorant. I was pretty stoked after receiving the parcel despite it being two months late. The quality of the products were really good, the ink doesn't run off, the designs looked good even though they were remade from scratch and other than the small miscommunication, the whole ordering process was made easy by Nadiah. If you are reading this and wonder where you can get these awesome stuff for yourselves, you can check them out on both Facebook and Instagram. They have quite a variety of pretty products to choose from like tote bags, clutches, posters, framed wall art and even laptop sleeves now. They focus more on Islamic Art but I'm sure they will be more than happy to create customized art. Once again thank you Farhana for hosting the giveaway and kudos to you guys from Dekor Geeks!